On Thursday's The O'Reilly Factor, during his opening "Talking Points Memo," FNC host Bill O'Reilly responded to Scott McClellan's contention, from that day's Today show, that he "felt like we were rushing into" war with Iraq in the run-up to the invasion, by showing a clip of former CIA Director George Tenet saying that before the war he "believed it in my core" that Saddam Hussein had weapons of mass destruction. FNC contributor Karl Rove further quoted a number of Democrats who proclaimed in the fall of 2002 the danger posed by Saddam Hussein, as they saw it. After O'Reilly mentioned that Saddam Hussein deceived his generals into believing he possessed WMD, Rove recounted that, according to the Duelfer report and the Kay report, Saddam Hussein "was spending vast sums of money to keep together the experts and the dual use facilities so that when the West lost interest in this and the UN sanctions failed, he could reconstitute easily." I felt like we were rushing into this, but because of my position and my affection for the President, and my belief and trust in he and his advisors, I gave them the benefit of the doubt. And looking back on it and reflecting on it now, I don't I should have. Let me say something very clearly to everybody. We believed he had weapons of mass destruction. ... I believed it going back to my time in the Clinton administration when we were concerned about Iraq. I believed, on the basis of 10 years of following it, data that we'd seen, his deception, his denial, his thwarting of the UN. I believed it in my core that he had it. O'Reilly then brought aboard Karl Rove, who read quotes from Hillary Clinton, Al Gore, John Kerry, Nancy Pelosi, and Ted Kennedy from the fall of 2002 speaking of the danger posed by Saddam Hussein. Rove further added that "every major intelligence agency in the world, thought that Saddam Hussein had weapons of mass destruction." SCOTT MCCLELLAN, FROM THE MAY 29 TODAY SHOW: I felt like we were rushing into this, but because of my position and my affection for the President, and my belief and trust in he and his advisors, I gave them the benefit of the doubt. And looking back on it and reflecting on it now, I don't I should have. BILL O'REILLY: Interesting, especially since former President Clinton and British Prime Minister Tony Blair, both of whom saw the same intel President Bush did, agreed that Saddam Hussein was a big danger to America. And so did the CIA. GEORGE TENET, CLIP DATED MAY 1, 2007: Let me say something very clearly to everybody. We believed he had weapons of mass destruction. O'REILLY: You believed it? Why? Specifically, you. TENET: I believed it going back to my time in the Clinton administration when we were concerned about Iraq. I believed, on the basis of 10 years of following it, data that we'd seen, his deception, his denial, his thwarting of the UN. I believed it in my core that he had it. O'REILLY: So let's do some logic here. 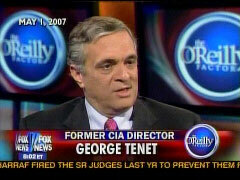 Why wouldn't Bush, Clinton, Blair, or Scott McClellan, for that matter, believe George Tenet? I would have. If McClellan would have objected to the way the Iraq campaign was handled rather than the motives behind it, I wouldn't have a problem with that. But insinuating some sinister action by the President doesn't hold up, even though the far-left kooks love that. KARL ROVE: Here's Hillary Clinton September, excuse me, October of 2002: "Intelligence reports show that Saddam Hussein has worked to rebuild his chemical, biological weapons stock, his missile delivery capability, and his nuclear program." Here's Vice President Al Gore in September of 2002: "We know that Saddam stored nuclear supplies, secret supplies of biological and chemical weapons throughout his country." Here's John Kerry in October of 2002: "I will be voting to give the President the authority to use force if necessary to disarm Saddam because I believe that a deadly arsenal of weapons of mass destruction in his hands is a real and grave threat to our security." And finally, Senator Ted Kennedy: "We have known that, for many years, that Saddam Hussein is seeking and developing weapons of mass destruction," September of 2002. And then, Nancy Pelosi: "Saddam Hussein has been engaged in the development of weapons of mass destruction technology, which is a threat to countries in the region. And he' made a mockery of the weapons inspection process." Everybody in the West, every major intelligence agency in the world, thought that Saddam Hussein had weapons of mass destruction. So the suggestion, that Scott provides no evidence for, that somehow that the information or the intelligence was dummied up in 2002 is simply incorrect. O'REILLY: And the other thing that convinced me was British intelligence, and the captured documents in Iraq that actually said Saddam Hussein told his own generals, for his own reasons, wanting to create paranoia and things like that, that he did WMDs. O'REILLY: Where are the weapons of mass destruction? Let's go get them. 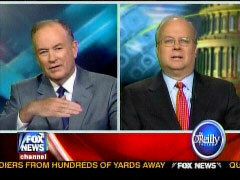 ROVE: -he could reconstitute easily.